There has never been a time with greater consumer engagement than right now, especially with the far-reaching capabilities of smartphones. However, with consumers’ ability to share positive ratings and experience also comes their freedom to post the negative about your reputation. While businesses in the obvious industries—such as hospitality and retail—are subject to such reviews, so, too, are healthcare practices. In fact, a survey by Software Advice, a tech research firm, found that 62% of those surveyed use online reviews as a first step to find a new doctor, 19% use online reviews to evaluate an existing doctor, and 44% would consider an out-of-network doctor if their reviews were better than in-network doctors. How can healthcare practices ensure they land on the winning side of the equation? That’s where online reputation management comes in. What is online reputation management? It’s controlling what potential or current consumers see when they Google your name. It helps stop, fix and prevent PR disasters while protecting and promoting your brand. Think your practice can’t be affected by bad press? A study by Outbound Engine found that 88% of consumers trust online reviews as much as personal recommendations. It’s important to make sure you’re getting a good recommendation. Negative: By far the worst category for a practice to be in. This means you have one or more negative search results tarnishing your reputation. These can be from official rating sites (like Yelp or Healthgrades), blogs, Twitter accounts or any number of other social channels. Irrelevant: These results don’t hurt you, but they don’t help you either. You may not be losing potential patients who are researching, but you won’t win their business either. Wrong: There may be other practices with the same name that are more relevant to online searches than you. Aside from consumers not finding information about your practice, they may read negative things about this other practice and attribute them to yours. Positive and relevant: Your search results are full of positive content, and your brand is well-represented. This is ideal, but still requires maintenance to continue. Why are Facebook “likes” important to a healthcare practice? The omnipresence of social media platforms has made them one of the fastest growing referral sources for businesses of all sizes and types. According to a study by The Spark Report, 41% said social media would affect their choice of a specific doctor. Your social media presence should serve as a testament to why patients trust you and also display the human face of your operation. You should configure Facebook, Twitter and Google+ profiles for your practice locations, and upload images and key information. It is also important to respond to social media posts (publicly or privately, depending on the post), as well as resolve any issues or complaints expediently and in accordance with best practices. How do you get positive reviews? People will be reading your reviews for proof of a strong, positive reputation. They want to see authentic and authoritative reviews that appear regularly and across a range of sites before they feel confident in your practice. Negative reviews on sites like RateMDs.com, Vitals.com and Yelp.com can hurt your online reputation and the success of your business. It’s imperative your information on these sites is correct and current; create and populate profiles for the sites your practice is not on, and seize opportunities to remove or respond to negative reviews without breaching doctor-patient confidentiality. 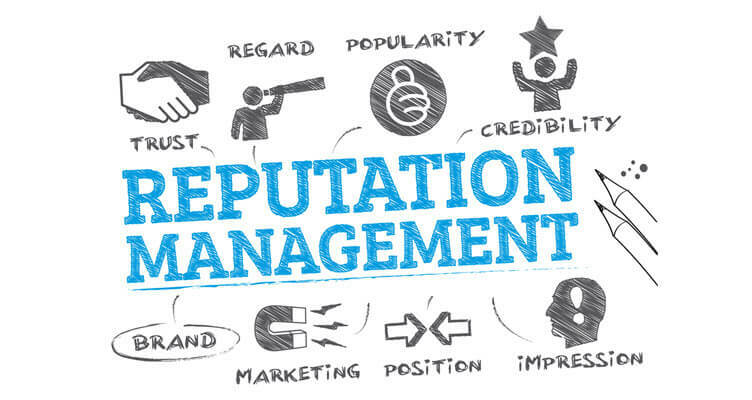 A successful online reputation management program needs to be multifaceted and include elements of social media, search engine optimization and owned, earned and paid media. It’s important to understand how these things impact your online reputation and use them properly—before a problem arises—because despite the amount of time and resources required to build a positive reputation, it takes considerably more to repair a negative reputation.